Standing cup and cover; body and cover formed of ostrich egg-shell mounted in silver, chased and gilded; body held by four vertical bands chased and pierced with formal scrollwork; upper border of similar design; stem represents spiral tree-trunk entwined by vine with lizard, squirrel and enamelled tortoise; base chased with framework containing trophies of fruit; cover bands similar to body, and surmounted by figure of ostrich holding horse-shoe; inside is silver-gilt medal with bearded bust to left of Hieronimus Loter on obverse; reverse: shepherd seated and leaning on hour-glass, sheep at his knee, castle in background; inscribed. Openwork. This object was previously owned by Nostitz, and collected and bequeathed to the British Museum by Ferdinand Anselm Rothschild. Origin: Prague, second half of 16th century; mark of an unidentified goldsmith, AK (in monogram). (i) On the foot (above the band of oval bosses within strapwork). (ii) On the underside of the calyx (at the base of the bowl, adjacent to the assay scraping). (iii) On the rim of the bowl (adjacent to the assay scraping). (iv) On the plain rim of the cover. (i) The assay mark for the city of Prague (R39312). (ii) The monogram AK (R39331). Provenance: Formerly in the collection of Count Nostitz, Prague. Commentary: The same pair of marks are recorded on two other objects: firstly, a silver-gilt chalice (Kunstgewerbe Museum, Berlin, inv. no. 98.27 - see Pechstein 1971, no. 34 with illus. ); and secondly, the silver-gilt foot of an onyx bowl (formerly in the possession of Count Moritz von Lobkowitz of the Schloss Raudnitz - see the Vienna Exhibition of 1899, cat. no. 644; also Rosenberg IV, 1928, p. 589, R39331(b), where it is stated that the bowl had a coat of arms and the date 1577). The Berlin chalice is also engraved with a date; it is contained within an inscription under the foot: “IM 1575 IAR HAB ICH VRSVLA FRAW v[on] PRVSKAW GEBORNE v[on] LOBKOWIGZ AVF ALTENBVRG DISEN KELGH ZUR EHR GOTTES VND MEYNER GEDECHTNVS MACHEN LASSEN”. It is known that Ursula von Lobkowitz was married in 1568 to Baron Georg von Proskau and, indeed, the three little shields on the trilobed foot of the Berlin chalice are engraved, firstly, with a crucifix; secondly, with the arms of Baron von Proskau (Proskowsky); and thirdly, with the arms of Baron von Lobkowitz-Zierotin. The chalice was acquired by the Berlin Museum in 1898 from Vienna but without any record of its post-Renaissance history. 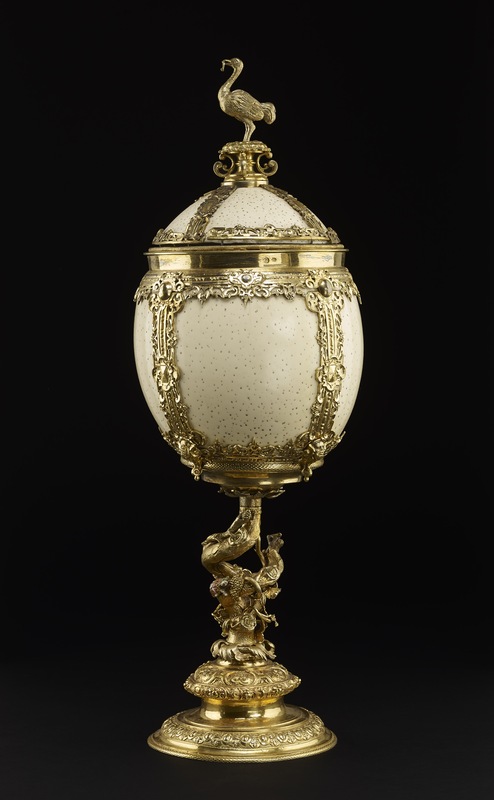 In many ways, this Berlin chalice is strikingly similar to the ostrich-egg covered cup in the Waddesdon Bequest, because it, too, is designed in a highly naturalistic fashion using openwork tree-trunks and branches entwined with vines and festooned with bunches of grapes. The same technique of piercing and undercutting - but carried to daring extremes - has been extensively used on the Berlin chalice, especially on the stem and knop; similarly, identical methods have been used to achieve the highly realistic surface details that are common to both pieces. Consequently, they appear to be not only the products of the same workshop in Prague but also creations of the same period - perhaps the beginning of the last quarter of the sixteenth century. Little has survived of the ordinary Prague goldsmiths' work of the sixteenth century with which to make comparisons, whilst the achievements of the international Court workshops of the Emperor Rudolph II (1576-1612) stand apart on a uniquely exalted level. Although the mounts on the ostrich-egg cup indicate that the monogrammist AK had a distinctive and perhaps personal interpretation of the repertoire of mid-sixteenth-century Mannerist ornament, nevertheless he was aware of current developments. His use of grotesque human masks with obtrusive strapwork is reminiscent of the designs of leading Antwerp artists like Cornelis Bos in the 1540s (see Hugh Tait, ‘Catalogue of the Waddesdon Bequest in the British Museum: Vol. II. The Silver Plate’, London, 1988, p. 78, fig. 58), whereas the use of the rectangular 'pyramidal diamonds' motif in silver-gilt is more Spanish. The light, almost delicate, openwork of this Prague goldsmith's mounts is also exceptional, whilst the naturalistic character of the tree-trunk stem may be part of the revival of interest in the Düreresque designs of the early sixteenth century - a trend that was to become so fashionable, especially among the goldsmiths of Nuremberg, before the end of the century. Indeed, one of the chief instigators of this 'Dürer revival' was the Emperor Rudolph II himself, and the city of Prague must have been one of the first centres after Nuremberg to be made aware of this new influential trend in Imperial Court taste. Alternatively, it might be argued that the use of the naturalistic tree-trunk stem was no more than a reflection of the conservative approach of so many patrons, especially outside Court circles. A typical comparable example, now preserved in Berlin, is the tall covered coconut cup attributed to “Nürnberg, um 1550” (see Pechstein 1971, no. 76, with illus. ), which also has a divided tree-trunk stem - but its many severely lopped branches create a more stark, if highly practical, effect. Even closer in design and character is the vine-clad tree-trunk stem of the famous Holzschuher cup, acquired in 1905 from the ancient patrician Nuremberg family of Holzschuher by the city of Nuremberg and placed on permanent loan to the Germanisches Nationalmuseum. It has a coconut in place of the ostrich egg and its silver-gilt mounts, although bearing no maker's marks, are struck on the foot (underside) by the reversed N (R33736); and that has contributed to the view that it may date from “before 1540” (see ‘Wenzel Jamnitzer und die Nürnberger Goldschmiedekunst 1500-1700’, exh. cat., Germanisches Nationalmuseum, Nuremberg, 1985, pp. 215-16, no. 11, col. pl. 2). The attribution of its sculptural and naturalistic design to Peter Flötner and its execution to the goldsmith Melchior Baier have received widespread support in the recent literature, although firm evidence is still missing. Similarly, there is no confirmatory evidence to reinforce Konrad Lange's suggestion (made in 1897) that, because of the inclusion of mining scenes on the lid, this magnificent Holzschuher cup may have been commissioned by a member of the Hungarian branch of the family who was heavily involved in mining and died in Moravia in 1564 - at Lettowitz, north-east of Prague. Consequently, any direct contact between the unknown Nuremberg goldsmith of the Holzschuher cup and the Prague monogrammist AK of the Waddesdon Bequest ostrich-egg cup remains hypothetical, although the influence of Nuremberg's naturalistic style in the work of this Prague goldsmith can scarcely be doubted. During the second half of the sixteenth century, this style spread throughout much of northern Europe and even reached England. No better-documented example can be cited than the ostrich-egg cup and cover that was bequeathed in 1593 by Richard Fletcher, Bishop of London, to Corpus Christi College, Cambridge, where it is still preserved - along with its cuir bouilli case (see ‘Cambridge Plate’, Fitzwilliam Museum, Cambridge, 1975, p. 20, no. MTO 10, with illus.). Its double tree-trunk stem rests on an embossed foot (marine creatures among the waves) and spirals upwards to the calyx beneath the ostrich egg; the simple mounts have lightly engraved decoration, including marine creatures on the everted rim of the bowl, and bear the London hallmarks for 1592-3 and the maker's mark RW (a pellet above). Bishop Fletcher's cup is, perhaps, more restrained than the Prague example but it demonstrates the long-lived popularity of this motif of the tree-trunk stem, especially for these tall standing-cups of coconuts and ostrich eggs. The colourful embellishment of the stem of the Waddesdon Bequest example with a brightly enamelled tortoise is neither practical nor original. The tortoise may have been a modern replacement for a lost original, but it seems very unlikely that the latter would have been enamelled since it was the normal practice to apply these little creatures in the dull white state or to have them gilded. It is likely, therefore, that the enamelled tortoise was added during the nineteenth century, probably at the same time as the repair to the top of the stem and the other additions were made. At that time, the finial figure of an ostrich may have been added because the figure's lack of quality suggests a modern origin. Indeed, it should be compared with the lively surface tooling and the characterful portrayal of an ostrich walking and holding a horseshoe in its beak, which adorns the cover of a tall ostrich-egg cup by a goldsmith of Crailsheim between 1630 and 1640 (see R. Sänger, Gold- und silberschmiedekunst , Bergkristall- und Steinschneidearbeiten, ‘Die Renaissance im Deutschen Südwesten’, exh. cat., Heidelberg Castle, Badisches Landesmuseum, Karlsruhe, 1986, p. 640, no. L. 44, with col. pl. and a reference to K. Schumm, Das Hohenlohe-Museum in Neuenstein, in ‘Württembergisch-Franken’, 24/25 (1945/5°), p. 220). Finally, the choice of a medal of 1544 for the inside of the cover by the restorer of the finial at some point in the nineteenth century probably indicates that this standing-cup was, at that time, thought to date from the mid-sixteenth century. The medal itself is not uncommon and examples were recorded in German public collections at Berlin, Munich, Leipzig, Gotha and Frankfurt (see G. Habich, ‘Die Deutschen Schaumünzen des XVI Jahrhunderts’, Munich, 1934, p. 281, no. 1953, pl. CCVI, 7). According to Habich, Hieronymus Lotter and his portrait medals had been the subject of three detailed publications by G. Wustman in Leipzig between 1875 and 1880, and it was then established that, although born in Nuremberg at the end of 1497 or the beginning of 1498, he rose to prominence as the Bürgermeister of Leipzig and, after a long and influential public life, died at Geyer in the Erzgebirge in 1580. Consequently, the anonymous nineteenth-century restorer's attempt to link this ostrich-egg covered cup with an historical figure of Leipzig, whose biographies were being published in the 1870s, was very understandable and probably offers a reliable clue to the date of the alterations and repairs to this exceptionally rare piece of Prague Renaissance goldsmith's work. Hugh Tait, 'Catalogue of the Waddesdon Bequest in the British Museum. II. The Curiosities', British Museum, London, 1991, no.3, pl. III, figs. 29-33.